Dollar Story . 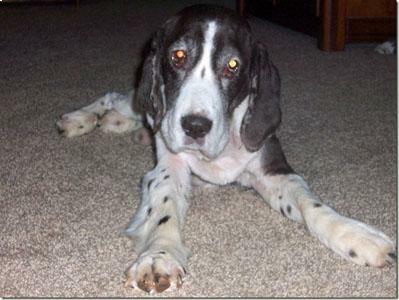 . .
Update 03/17/2013: "In peaceful and loving hands, he passed to the Rainbow Bridge and will surely be waiting for those who were most special to him." Since becoming a MAESSR gent, Dollar had made a valiant effort to get healthy again. He made good progress in beating his ear and skin infections but, when his first course of treatment was completed, the skin infection returned and he was put back on medication. During this time, his overall health was slipping noticeably. His hips were giving him more trouble and he was showing an increasing inability to control his bladder. Original: "Dollar has settled into the foster home routine very well, showing no anxiety or restlessness." Meet Dollar—MAESSR’s most recent elder statesman. This handsome and charming senior came into MAESSR’s care when his Maryland owner took a fall and became unable to care for him properly. It was a hard parting as they had been together for all but the first year and a half of Dollar’s life. At 14 years old, Dollar displays some of the physical characteristics of a senior-- trouble with his hips, cataracts, and a little deafness. And, of course, he has a tendency to take lots of naps! His age has not affected his friendly and affectionate personality, though. He loves everyone, seeking people out for hugs and ear massages. And he’s still playful, at times joining in with the resident Springer’s racing around the house and other shenanigans. Dollar has settled into the foster home routine very well, showing no anxiety or restlessness. He is housetrained and signals when he wants to go out by standing at the door. He only has had a few accidents in the house when he didn’t get out quickly enough. In the car he rides well in the crate, but he doesn’t care for being crated in the house, preferring to sleep on a dog bed on the floor in his foster mom’s room. He has the run of the house when his foster mom is away from home and there have been no problems with this policy. With good house manners, Dollar doesn’t jump on the furniture or counter-surf and doesn’t chew on things he shouldn’t. However, he is a little too interested in the trash if the door to it happens to be open and he tries to get into his food bag if his foster mom forgets to put it away. Dollar does not resource guard his food, but he is very fond of the rawhide chews he gets and will issue a warning growl if the resident Springer gets too close while he’s enjoying his nightly treat. This old gentleman walks at a very leisurely pace on the leash. He doesn’t take long walks, preferring to stroll around the back yard for his exercise. He does fairly well off-leash even though he sometimes tends to wander off; however, it’s easy to catch up to him when he does. Dollar does not respond to any commands. Whether this is because he can’t hear them or is just invoking old-age privilege is unknown. Dollar deserves a gold star for his tolerance and acceptance of grooming activities. He enjoys baths and loves the feel of the hair dryer. He underwent a thorough and lengthy haircut and grooming without complaint. His foster mom says she’s never met a more agreeable dog when it comes to grooming! Dollar did well during his check-up with the vet, too. He allows his ears, paws, and mouth to be handled with no problems. Good boy! 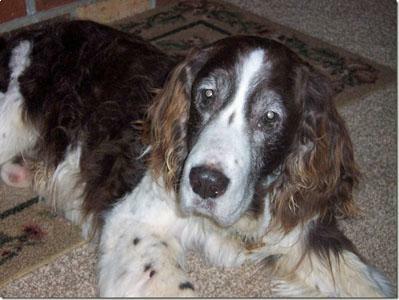 This wonderful Springer is looking for a home where he can live out his sunset years in peace and dignity. He does great with kids, but probably would prefer a less active household where his person is home a good part of the day to give him the attention and care he deserves. Dollar is just waiting for that perfect, senior-loving family to make him their own.